The main screen offers Pre-K, Kindergarten, and 1st grade apps. There’s also a camera with filters, books, music, and more! By the way these apps are NOT dependent on internet connection, although there is wireless capabilities available if needed. 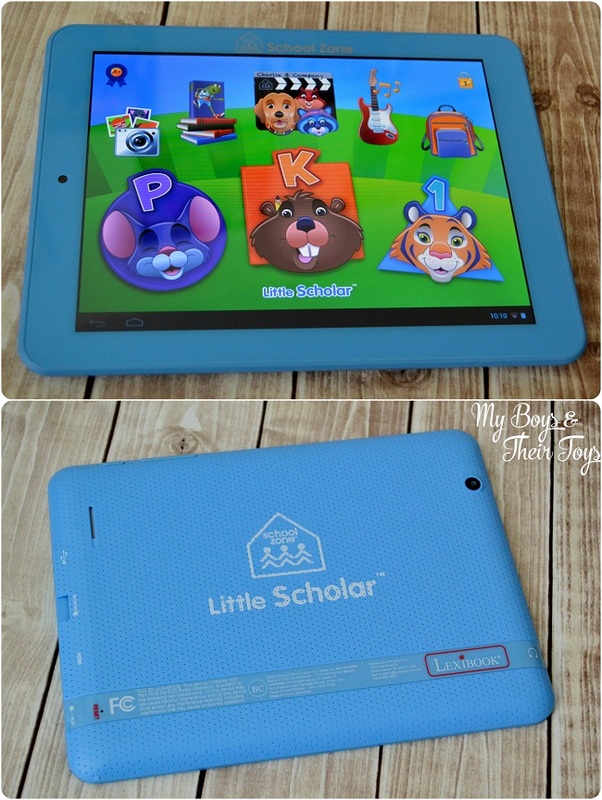 Little Scholar runs on Google Android 4.2.2 operating system and offers an 8-inch screen. I appreciate the textured easy-grip protective bumper because we all know how rough kids can be at times. L and I have only worked on the Pre-K apps so far, but I am already impressed. 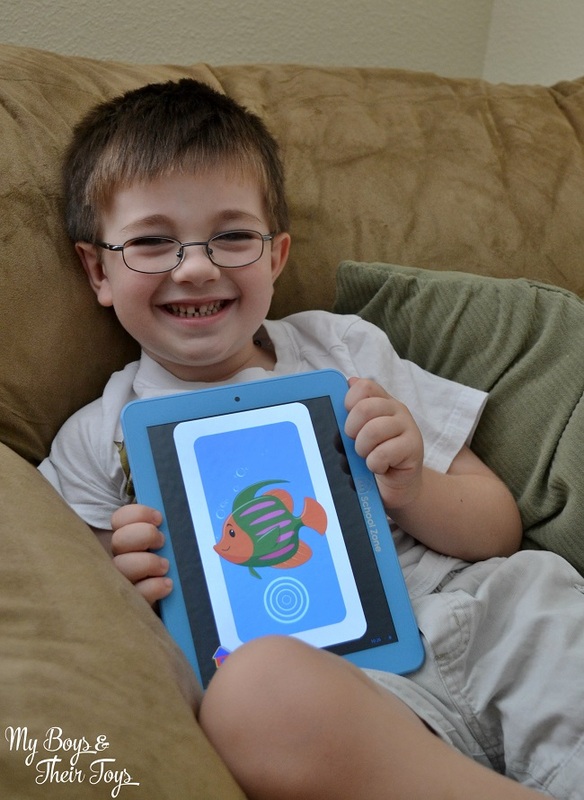 His favorite learning apps include the interactive flashcards, music and art. He really can’t get enough of his very own learning tablet. He loves playing the games. And I appreciate that they are all kid-safe, and helping him to grow his learning skills. Plus parents have the A+ app in the top left corner to view graphs and reports of your child’s activity with each program. Charlie and Company features children’s music by Brian Vander Ark of The Verve Pipe. The only thing I saw missing from the music section was a simple app singing the A, B, C’s while showing the letters. Possibly that’s in the Kindergarten series, but I feel it’s a song worth adding to the collection. 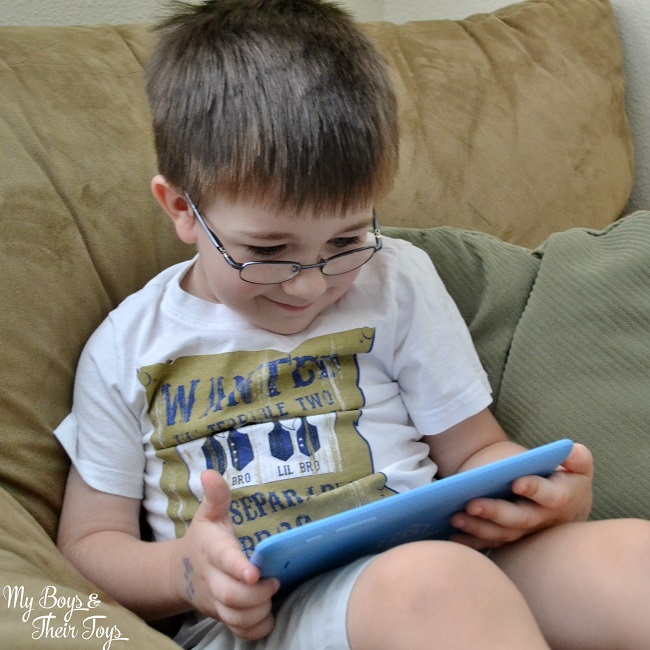 The Little Scholar learning tablet is a regular necessity for trips in the car, and is especially helpful while waiting in the carpool line for big brother. I really see Little Scholar being a great asset to L’s learning, and look forward to seeing him grow! As I mentioned above, Little Scholar does not require Wi-Fi to work. Everything is made simple for both the child and parent. It’s a definite win-win, and great value. Little Scholar is available at Toys R Us beginning this fall. I am certain it will be a sought after tech product for the holidays. 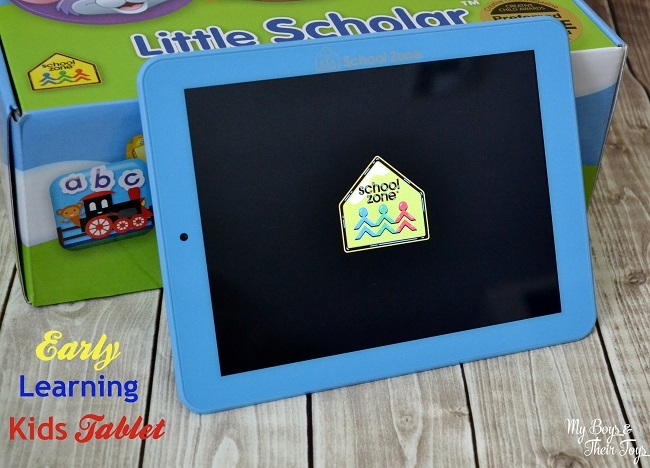 Enter below for your chance to win a School Zone Little Scholar Tablet! We have a Little Scholar and my 4 year old absolutely loves it! I like that it does not require Wi-fi to work and I like the 200 Pre-loaded learning apps. I like that the Little Scholar does not require Wi-Fi to work. This is an awesome giveaway, going to get something like this for my two year old for christmas. Thank you for the chance. My favorite feature would probably have to be the 200+ learning apps, books, songs and videos that are preloaded onto the School Zone tablet!! I love the pre-k apps and the textured easy-grip protective bumper. My kids are rough! I like that it dent have to be connected to WiFi and that it comes with so many activities and games already loaded! Love that you don’t need wifi! I love that it comes with Pre-k, Kindergarten and 1st grade apps! It would be perfect for my 3 and 5 year old!! I love that it does not need wi-fi to work! I love the apps and the parental controls! 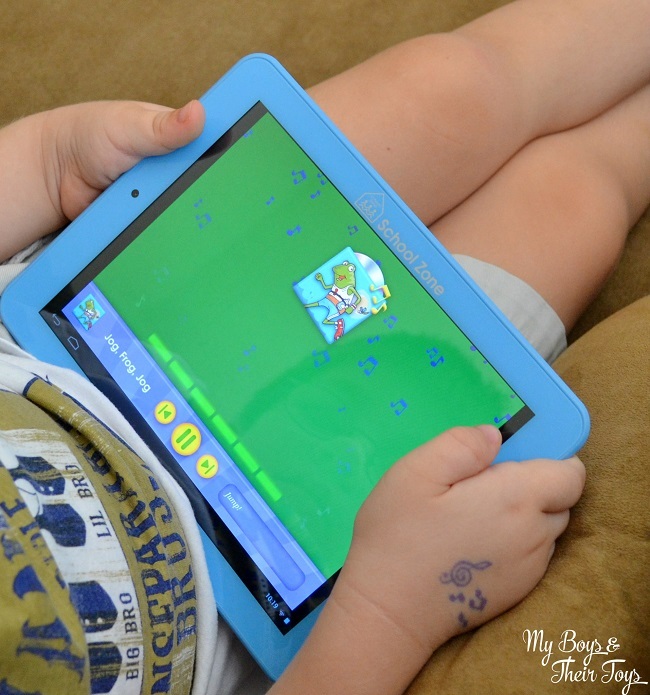 My favorite thing is that the Little Scholar tablet is preloaded with School Zone’s 200+ learning apps, books, songs and videos designed to help my kids learn. How awesome is that! 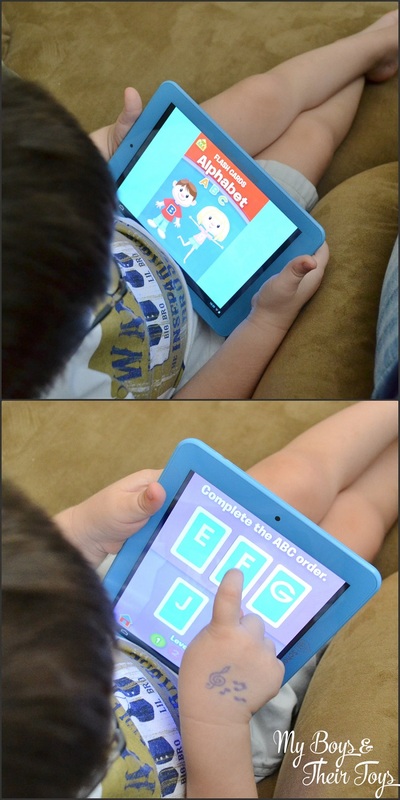 I love that this tablet is preloaded with over 200 learning apps, books, songs, and videos! That’s fantastic! I love that this can be sued in the car when no wifi is available! I love the 8 inch screen, a great size for young children to manage. I love that the apps can grow with my child. I love the fact that it has Pre loaded apps on it! So many Pluses about this tabled. I love that it has a music app. I love that it is protected. I adore that it is pre leaded. I love the smile on your child’s face! That says allot! He loves the learning games he is playing. I love that they are EDUCATIONAL apps. We have a kindle fire that my son uses now, and hate it because they are all non educational games. I love that parents can monitor their progress! So cool! Oh my favorite feature is that it is preloaded with School Zone’s 200+ learning apps, books, songs and videos!!! Gets too costly when you have to buy all the cartridges. I love that it has so many! I LOVE that it is preloaded with School Zone’s 200+ learning apps, books, songs and videos! I like that it doesn’t require WiFi to work. I love for my children to be able to play things while on the road. 200 pre downloaded apps is awesome! I love how many apps there are for my littles to LEARN from. I like that it’s not dependent on a internet connection. I love all the educational apps that are already loaded onto the tablet. It makes things so much easier. I like that it has an easy grip bumper and doesnt need wyfy. I like the preloaded apps. LOVE that you don’t have to connect to wifi! What a great feature – and SAFE! l like that it’s preloaded with over 200 apps. I like all the pre loaded apps – that is great. I love that the screen is big enough and it has a protective bumper! Love that it has the protective bumper because my son loves to throw things and things break so easily! lol. I like how there are SO Many different apps to choose from. it’s really mind boggling. I like the learning apps!! I like the preloaded apps! Learning apps, and the front and rear camera! I like that it has pre-loaded apps and that you don’t need to be on the internet to play. That it doesn’t need WIFI!!! Awesome! I really like that the Little Scholar tablet is not dependant on an internet connection. This makes it easy and convenient to use on a car trip. I like that-The main screen offers Pre-K, Kindergarten, and 1st grade apps, these apps are NOT dependent on internet connection. although there is wireless capabilities available if needed. I love that it comes with preloaded apps and that you don’t need wifi for it to work. I love that the Little Scholar has so many learning and music apps already loaded onto it and is ready to go. 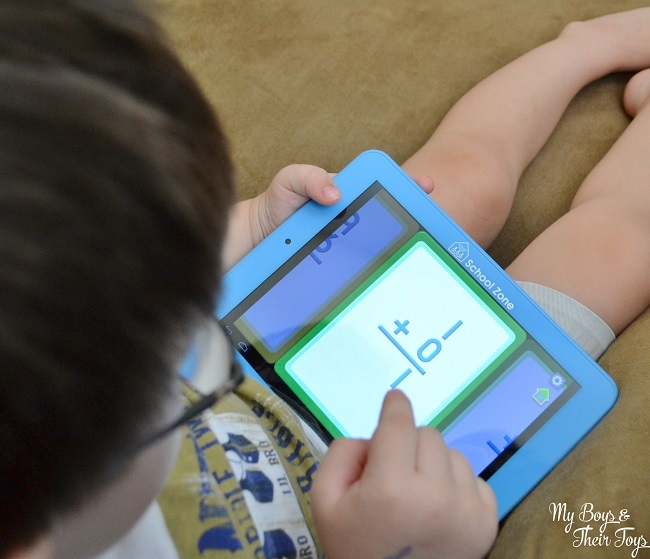 I like all of the learning apps and that it is durable. I like that it is rugged and great educational tool. I like that it doesn’t need wifi to work! I like that it’s already pre-loaded with a lot of educational games. It seems like anything you buy these days, you also have to buy 1000 games or add ons to go with it, and of course that costs a ton in the long run. I like that it comes with preloaded apps and games. It would make learning fun. I love how this tablet does not require Wi-Fi! Our internet is spotty, at best, so that’s a great feature! Very nice you don’t need WIFI to play in the tablet! I love that: Napoleon Bone Apart teaches science & eye-hand coordination, so many cool features. I love that it comes with the apps preloaded and is ready to use out of the box. I love the apps on it! Preloaded apps. That is the best.